Lithuania played against Britain a week ago in Vilnius, March 5-7 2010, in Davis Cup match in the Europe Africa Zone Group Two series. 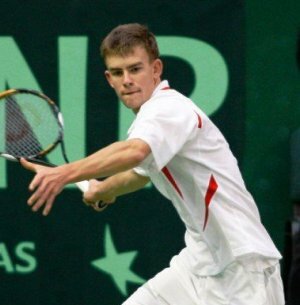 Lithuania defeated Britain, producing a major upset for British tennis, with British press calling it the British Davis Cup team’s most humiliating defeat in their history. This was especially so as all of the players on the Lithuanian team were still teenagers, with the oldest only 19 years old! thus 2:2. The last match saw Laurynas Grigelis win against the much higher rated Dan Evans in a thrilling contest of more than four hours. The captain of Britain’s Davis Cup team John Lloyd declared “Grigelis was at times stunning… I thought he was absolutely brilliant”. 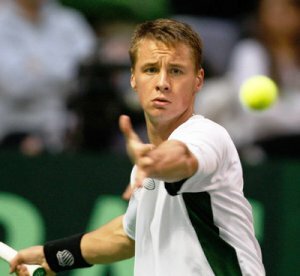 Commentators have been pointing out that while Lithuania only spends about $150,000(AU) dollars a year on tennis, Britain spends a staggering $100,000,000(AU) and has 25 players in the world’s top 1,000, compared to Lithuania’s 3. Lithuania’s win against Britain is thus all the more remarkable. At the moment tennis in Lithuania is not a hugely popular game, but this win by Lithuanians is certain to increase its popularity. The Davis Cup match was played in a stadium in Vilnius named after the late Vitas Gerulaitis, who was born in America of Lithuanian parents and was a world ranked tennis player in the 1970’s.